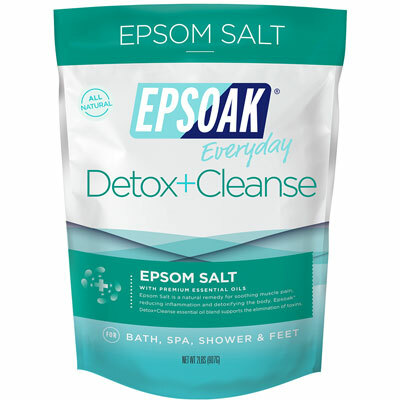 Epsoak® Everyday Detox + Cleanse by San Francisco Salt Company is made with premium Epsom Salt (Magnesium Sulfate) infused with essential oils known for their detoxing abilities like eucalyptus, citrus, and tea tree. Detox and Cleanse is an all-natural remedy to soothe tired and aching muscles while promoting the detoxing of the skin and body. 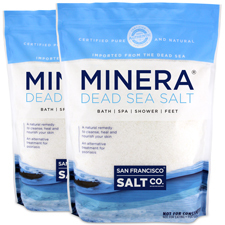 It’s the perfect bath soak/foot soak for relaxing at the end of a long day. 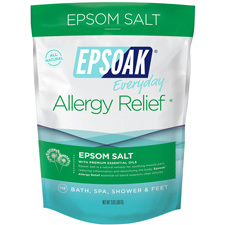 Known for its premium quality and many therapeutic uses, Epsoak® Epsom Salt dissolves easily in warm water. Epsoak is a naturally translucent/white salt in medium grain (0.2-3mm). Why Choose EPSOAK Everyday Detox+Cleanse? 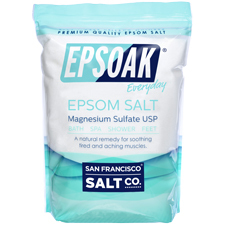 SOOTHE ACHES & PAINS:�Use Epsoak Detox and Cleanse in a bath or foot bath to relieve muscle aches & pains and stiffness. The perfect evening bath after a stressful or demanding day. Ingredients: Magnesium Sulfate (Epsom Salt), Aloe�Barbadensis (Aloe Vera) Leaf Juice, Tocopherol�(Vitamin E), Eucalyptus Globulus (Eucalyptus) Essential�Oil, Lavandula Angustifolia (English Lavender) Essential�Oil, Lavandula Hybrida (Lavandin) Essential Oil, Citrus�Limon (Lemon) Essential Oil, Rosmarinus Officinalis�(Rosemary) Essential Oil, Melaleuca Alternifolia (Tea�Tree) Essential Oil, Cananga Odorata (Ylang-Ylang)�Essential Oil.